This starter is ideal for making ahead and reheating later. Caramelising the onions at the beginning adds an extra dimension to the flavour of the soup. This can be prepared in advance if required - just leave out step 3 until ready to serve. Heat the oil in a very large pan then add the onions and sugar and cook gently for 10–15 minutes until very soft and dark golden. Add the paprika and cook for a minute more. Add the pumpkin or squash and stock, then bring to the boil. Cover and simmer for 20 minutes or until the squash is very tender. Remove from the heat and purée with a hand-held blender until smooth and velvety. When ready to serve, gently reheat the soup, stirring in the cream towards the end. 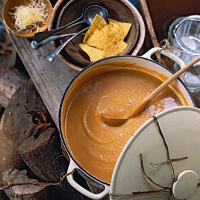 Once piping hot, ladle the soup into bowls or large mugs and sprinkle over some crushed tortillas and Gruyère. Let everyone add their own Tabasco, according to taste. This recipe was first published in Tue Sep 01 01:00:00 BST 2009.